The September issue is GREAT. Brought back lots of real good memories. Farmers markets where you get real good veggies right out of the gardens — we do not get that down here where I live. It’s nice to see the historic Canterbury Shaker Village with their recipes. The foliage is starting, too. When the leaves change color it’s real beautiful to see. We used to go to most of the fairs too. Why do people have to mess up history? I hope New England and New Hampshire can say NO to Northern Pass. You need to keep it the way it is. It’s been there for a long time. 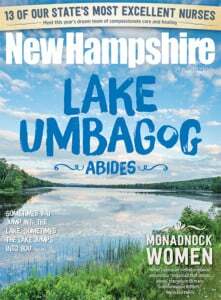 I love New Hampshire Magazine and cannot wait until it comes in. Editor’s note: Thanks, Steve. Lucky for local beer lovers, the state is filled with exceptional breweries with more opening seemingly every month! We should say that we’ve tried your beer and can attest to readers that it is indeed worth the trip. Those interested in more breweries that we couldn’t fit into the issue should visit nhmagazine.com/beer. In response to last month’s “Editor’s Note”: Some time ago, not long after I had enlisted, my father, who had his paranoid moments, decided that the next-door neighbor had moved the boundary marker between the two adjacent lands, so he hired a surveyor to prove this. Not only did he learn that he was wrong, but he also learned that the town had the wrong area for his property. Instead of having nine acres, he had 11 1/2 acres. He had to pay for the surveying and his property taxes went up. Thanks for calling attention to the new film on New Hampshire’s African-American experience, “Shadows Fall North” [“Review,” October 2016]. Valerie Cunningham and JerriAnne Boggis are, indeed, the driving force behind the film and a possible new NH Black Heritage Trail. And Valerie did identify the location of the African burying ground that is now a memorial park in the middle of Portsmouth in research for her book “Black Portsmouth,” and marked it with a plaque when she created the Black Heritage Trail in 1995. Still, there’s an important point to make about the creation of the Portsmouth African Burying Ground. When the remains were uncovered in 2003, the city of Portsmouth assembled community discussions and appointed the Mayor’s Blue Ribbon African Burying Ground Committee chaired by Vernis Jackson. Over the next 12 years, Vernis and the committee worked tirelessly to direct the design and fundraising process that made the memorial a reality. By including as many community voices, hands and hearts as wanted to participate, the memorial became the opportunity for discussion surrounding the realization that the African Burying Ground in Portsmouth was “not black history or white history, but our history.” Hundreds of people, from children to seniors, foundations, businesses and a wide spectrum of colors and incomes contributed in amounts from $5 to $50,000 to raise the needed $1.2 million. The [sign in the] park says, “We stand in honor of those forgotten.” That conversation is perhaps the true memorial to New Hampshire’s past, present and future. Love your articles — have you done anything on top veterinary care in New Hampshire? If not, I think it would be a great article. There really isn’t a whole lot of information out there for the best doctors for our friendly critters. Editor’s note: We’re planning a pet guide issue for the coming year, so stay tuned! We’re not exactly sure what will be included, but it will definitely contain all sorts of critter-friendly information. I am enclosing a poem for possible publication. It recounts an incident about a skunk with a bottle stuck on his head that my husband saved. Appreciating nature, and summer’s grand debut. It was a skunk with a bottle on his head walking by. But he was determined to save the skunk and to persevere. And my husband followed close behind, watching in dismay. I would have loved a video to catch that live! Then the freed skunk went flying, and must have had quite a fright. My husband took a tumble trying to make his getaway. He had saved that poor skunk, not able to eat or drink, with death near. But God speaking to him to save that skunk was not a coincidence.